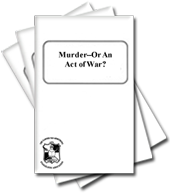 Murder - Or An Act of War? This table shows the correct answers to the questions for Lesson 1. The questions are generated from the doctrine on God. To check the text of the doctrine for each question and answer, go to the Check Text Page. 19. Romans 8:19 states that the entire creation, "waiteth for the manifestation of the ___ of ___."